'Off-press' gigantic scale relief printmaking- against all odds. 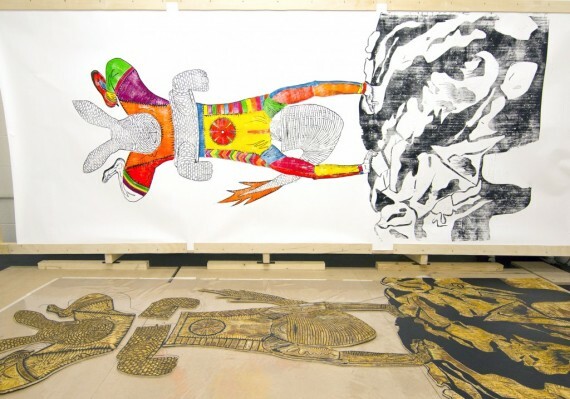 A challenging investigation into new contemporary ways of working with analogue print media, involving the large-scale construction of gigantic hand-made woodcut prints in vivid colour. I always try to work from source imagery for these body parts, to help with scaling and perspective. So I have started the day with a photo-shoot that resembles a bad limbo contest! Alexander Stevenson is a visual artist and project maker based in the UK. Often working with the perception of 'knowledge' (surrounding specific groups of people or institutions) to produce diverse outcomes that are analytical, witty and intriguing. These artworks intend to question the way in which we relate to knowledge and knowledge systems. This includes objects and activities that explore and challenge ways of archiving, our relationship to history, cultural appropriation, shared beliefs, personal myths, and the act of re-presentation.